Revelation 12 describes the vision of the apostle John called ‘the sign in the heavens’. He stands on the sand next to the sea when this cosmic drama is presented to him. The dramatic quality of the vision is intensified by the contrast of black and white. The painting shows the main actors in the vision: the woman, the Child and the dragon, who could be taken to represent Israel, Christ and Satan. The idea behind the painting is that John's vision can sporadically be really seen in the night sky by means of the constellations. The dragon (constellation Draco) is thrown out of heaven by the archangel Michael. Then he appears on earth as a seven-headed dragon with seven crowns. With his tail he sweeps down a third of the stars and throws them to the earth. These stars are the fallen angels, who are visualized as the black tail of the dragon on the left side of the painting. Michael (constellation Hercules) stands on the head of the dragon. The woman (constellation Virgo) is clothed with the sun to the right of her and the moon is under her feet. Twelve stars are on her head (constellation Leo and the planets Mercury, Mars and Venus). She is pregnant and gives birth to a child (constellation Libra or balancing scale, symbol of the justice which the male child will bring to the earth). The dragon aims to destroy the woman and the Child by the water that pours from his mouth (constellation Hydra). All constellations mentioned in the vision can be seen in the northern hemisphere. The woman (constellation Virgo) has a crown of twelve stars on her head, which normally are the nine stars of constellation Leo. Once every 7000 years however the crown is completed by the planets Mercury, Mars and Venus, as they form the remaining three stars. Only recently it has been possible to calculate this frequency of occurrence of the twelve stars in the crown of Virgo by using NASA software. The first occurrence will take place on 23 September 2017. If you would like more background information, just google ‘Revelation 12’. It cannot be proven that the vison in Revelation 12 refers to the combination of constellations and planets on 23 September 2017. But the idea that this vision is not only a metaphor but will be visible in the firmament, is fascinating. The Bible is clear that God can speak by means of astronomical phenomena, for instance the star of Bethlehem. Psalm 19:2, The heavens are telling the glory of God; and the firmament proclaims his handiwork. Psalm 147:4, He determines the number of the stars; he gives to all of them their names. Isaiah 40:26, Lift up your eyes on high and see: Who created these? He who brings out their host and numbers them, calling them all by name; because he is great in strength, mighty in power, not one is missing. 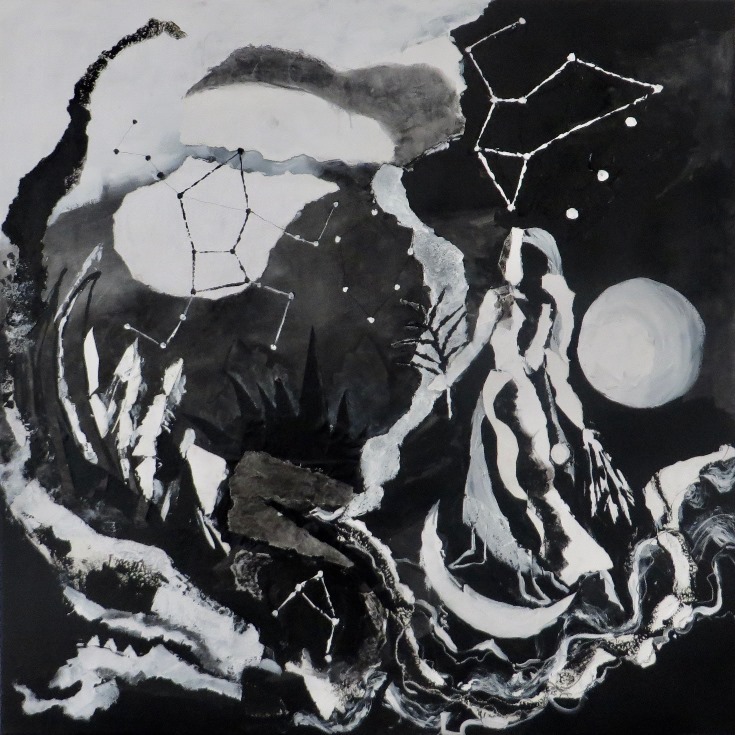 Marja Streefland: The Sign in the Heavens, 2016, mixed media on canvas, 100 x 100 cm. Further reading: E.W. Bullinger: The Witness of the Stars, Kregel Pubns (January 1984).